Proper Posture 101: Posture is the position in which you hold your body upright against gravity while standing, sitting or lying down. Good posture involves training your body to stand, walk, sit and lie in positions where the least strain is placed on supporting muscles and ligaments during movement or weight-bearing activities. Maintaining good posture involves training your body to move and function where the least strain is placed on the body. Good posture improves the physiologic function of your body, while improving your appearance. Your posture has a positive or negative influence on the daily activities that you do. Good posture demonstrates confidence, balance, pain free movement and enhanced physiologic function of your body. Whereas poor posture causes additional stress to the body, spinal degeneration, and diffuse pain. Simply correcting your posture can enhance the quality of your life and overall health. Good posture promotes movement efficiency and endurance and contributes to an overall feeling of wellbeing. The return on investment for better posture will be astounding in later years. We simply cannot afford to neglect our postural needs, especially when so much of our ability to function is riding on the quality of our postural alignment. An inward curve at the lower back (lumbar curve) Good posture helps maintain these natural curves, while poor posture does the opposite — which can stress or pull muscles and cause pain. Spine: Good posture actually means keeping the three curves of your spine in balanced alignment. Misalignments of the vertebrae, or spinal subluxations, cause postural abnormalities. Muscles. Strong and flexible muscles also are essential to good posture. Abdominal, hip, and leg muscles that are weak and inflexible cannot support your back’s natural curves. Joints. Hip, knee, and ankle joints balance your back’s natural curves when you move, making it possible to maintain good posture in any position. “Core Musculature” and their effect on posture: The “core musculature” is comprised of several groups of muscles including the transversus abdominus, multifidus, diaphragm and pelvic floor muscles. These muscles work together to produce maximum stability in the abdominal and lumbar region, as well as coordinate movements of the body. A very common cause of low back pain is weak core musculature. 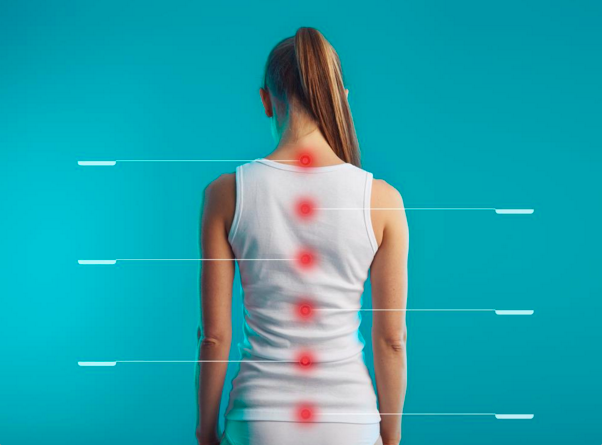 When the muscles that support the spine are weak, pain can be triggered by muscle strain, and injuries to the muscles, ligaments, and discs that support the spine. Over time, a muscle injury that has not been managed correctly may lead to an overall imbalance in the spine. This can lead to constant tension on the muscles, ligaments, and bones, making the back more prone to injury or re-injury. Core exercises are an important component of any postural correction program. Core exercises train the muscles in your pelvis, lower back, hips and abdomen to work in harmony. This leads to better balance and stability, whether on the playing field or in daily activities. In fact, most sports and other physical activities depend on stable core musculature. Strong core muscles make it easier to do most physical activities, whereas weak core muscles leave you susceptible to poor posture, lower back pain, and muscle injuries. It pays to get your core muscles in better shape. Proper posture is a key component to optimal health and wellness: Perhaps the most important benefit of good posture is that it improves function of the internal organs. When the body is in a slouched forward position (head and shoulders rolled forward), our rib cage is actually pushing down on our internal organs. Common short-term effects are muscular soreness, neck pain, and headaches. Long- term effects include: decreased respiratory capacity, digestive problems, and migraines. If postural imbalances go uncorrected, further consequences may occur throughout the body, such as: spinal degeneration, muscle soreness, and arthritic joints. Keeps bones and joints in the correct alignment so that muscles are being used properly and efficiently. Prevents the spine from becoming fixed in abnormal positions (for example an abnormal lateral curvature, or scoliosis). Prevents backache, neck pain, and diffuse muscular pain. Consequences of poor posture: Good posture is also good prevention. Poor posture can lead to excessive strain on our postural muscles and may even cause them to relax, when held in certain positions for long periods of time. For example, you can typically see this in people who bend forward at the waist for a prolonged time in the workplace. Their postural muscles are more prone to injury and back pain. Check your posture reflection in the mirror: Perform a posture self check in the mirror each morning. What does your reflection show? Good, strong, confident posture? Or slouched forward and closed posture? Be sure to fix your posture before leaving the house- just as you would do if your hair is out of place. Perform the “Wall Test”: To test your standing posture, take the wall test. Stand with your head, shoulder blades and buttocks touching a wall, and have your heels about 5 to 10 centimeters away from the wall. Reach back and slide your hand behind the curve in your lower back, with your palm flat against the wall. Ideally, you’ll feel about one hand’s thickness of space between your back and the wall. If there’s too much space, tighten your abdominal muscles to flatten the curve in your back. If there’s too little space, arch your back so that your hand fits comfortably behind you. Walk away from the wall while maintaining this posture. Keep it up throughout your daily activities. Three signals of bad posture: If you experience any of the following three consequences, you should schedule an appointment for a chiropractic adjustment. These signals indicate that your posture is not correct, and there is likely a misalignment of your spine. Good posture for life: Changes occur naturally in your body as you grow older. These changes can influence your posture and make it more difficult to maintain a good posture or correct a poor posture. The discs between the spinal segments become less resilient and give in more readily to external forces, such as gravity and body weight. Compression and deterioration of the spine cause an increased flexed, or bent forward, posture. Leading a sedentary lifestyle also impacts your posture greatly. Sitting for long periods of time shortens various muscles, which results in the body being pulled into poor postural positions, and stretches and weakens other muscles, which allows the body to slump. Despite the changes that occur naturally with aging, good posture can be maintained and improved. We must consciously work at achieving and maintaining good posture as we grow older. Proper posture is an important lifestyle behavior for long-term longevity. Yearly Posture Evaluations: Everyone starting at the age of 6 years old should have a yearly posture evaluation performed by a Certified Posture Expert. Posture evaluations should include Posture Imaging to detect for early onset postural degeneration and postural collapse. To have a yearly posture evaluation performed for you and your children, contact us (925) 837-5595 for an appointment.